The St Vincent de Paul Society in Victoria hosts an annual celebration, A Call to Serve, to recognise members of the Society who, as representatives of all our members and volunteers, have delivered outstanding service to the people we serve. 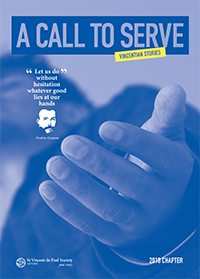 Through the power of story-telling, we pause to honour these Vincentians together with their family, friends, community members and fellow colleagues from the Society. On the Saturday 15 September 2018, the A Call to Serve ceremony was hosted at St Clare’s Catholic Church in Box Hill North, where five videos were shared. These are the stories of John McCarthy OAM; Geraldine Grimmett; Evert Jansen and Matt Dileo. Thank you for your invaluable contribution to our community.